You can now join me on the remarkably popular Facebook to keep up with goings on in my life, both inside and outside of the studio. Just send me a friend request through Facebook and Ill get you onboard. Painting CD Price Increases (sorry). 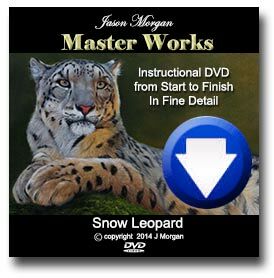 I’ve kept the price of my Learn to paint wildlife art CD exactly the same for a couple of years, but unfortunately due to steadily increasing postage, printing and CD costs I am going to have to increase the price or drop the CD completely and offer it only as an e-book. So I have decided, for now, to increase the price as some people might still rather a physical (CD) copy the price will go up from next week and I will probably stop producing the CD entirely by the end of March/April (it will be still available as an e-book), so if you want to beat the price increase please buy ASAP. Most people think oil painting is difficult, but in reality it is one of the easiest / most forgiving mediums of all, ideal for beginners and my new book specifically demystifies the whole process of painting with oils. In it I have concentrated on guiding the would be artist from absolute beginner onwards ie selecting materials, (even giving a shopping list) through to colour mixing, making 1st marks and all the way up to creating finished paintings. The project started off as a complete beginners guide, but in reality it had developed in to so much more, basically everything I know about oil painting is in it! I hope to have it completed in approx 1-2 months so watch this space. Over the last few years I have been fortunate to have sold all my originals soon after completing them, but the downside of this is that I havent had anything available for the yearly art shows. So this year I am going to try to find time to schedule in some paintings specifically for the shows. 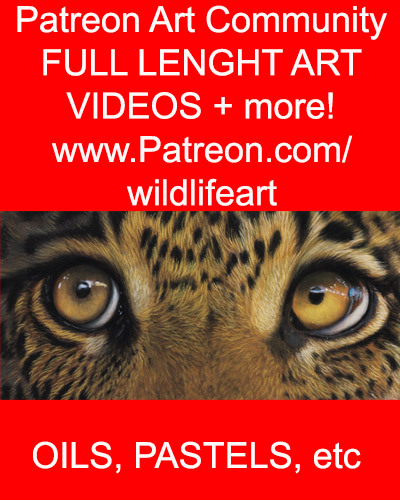 Each painting will be very different from your standard wildlife portrait, as I continue to push the boundaries on my own wildlife art.